Sometimes the best flavors come in modest packages. My sister, Sarah, and I know this firsthand after a trip to Washington, D.C. a few years ago. That weather in D.C. that weekend was abysmal — cold, rainy, and windy. Not blustery or breezy, but gale-esque. Sarah and I stopped in at cafes or coffee shops regularly to warm up, and I bought fuzzy shoes to replace the worn out flats I’d been trying to trek around the city in. On Saturday night, we pulled out the short list of potential restaurants we’d compiled before we left Charlotte. Zaytinya, which boasted a “mezze menu inspired by Turkish, Greek and Lebanese cuisines” stood out to me right away, and we decided to head in from the cold and have a nice dinner. Now, listen. I love Brussels sprouts and have since I was little. Nice buttery little Brussels are always welcome in my tummy. Roasted, steamed, shredded into a weird slaw — I’ll eat ’em any way you give ’em to me. However, that being said, I think we can all agree that it’s an unexpected twist when a fancy, creative restaurant boasts that the best thing on their menu is the Brussels. They’re good and all, but not best material. Sarah turned kind of sprouty green herself, since she’d had a traumatic experience with Brussels sprouts as a child. Nevertheless, she mustered up her bravery and open-mindedness and we ordered the Brussels. When they came, we each took a curious bite and (cue trumpets and joyful singing) were amazed. These were not just the best Brussels we’d ever had, y’all. This was one of the best dishes we’d ever had. I wish I remembered more about it to fill you in, but all I really remember is coriander and awesomeness. The point is this: incredible things can come in unexpected packages. 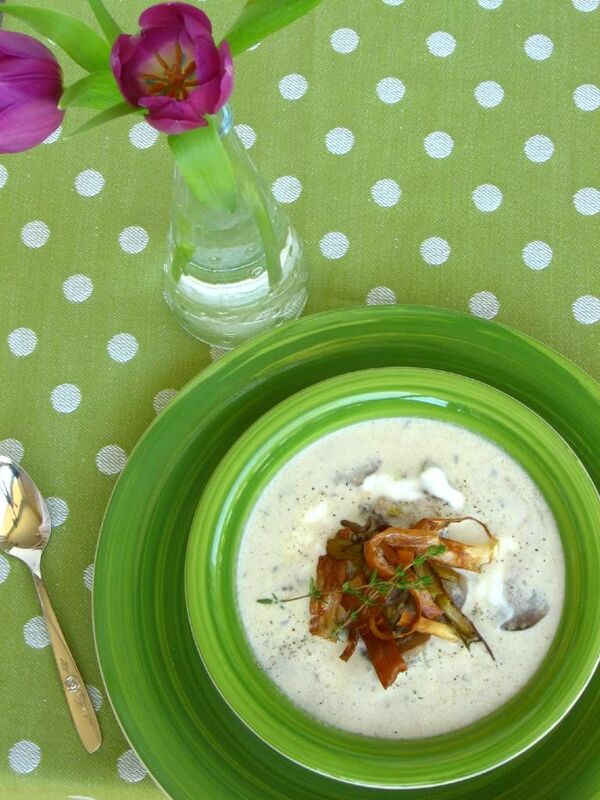 This modest, simple to make Cream of Mushroom Soup is another perfect example. My sweet Sunday school teacher, Joyce, invited me over and I arrived to find a lovely spread of fresh fruit, crackers, a bright citrusy salad, decadent parfaits for dessert, and this soup as the star of the show. I knew it was going to be comforting and delicious, but — much like with my D.C. Brussels sprouts experience — I didn’t realize I’d be blown away! The mushroom flavor is so rich and pronounced, and thyme is the perfect complement. And oh goodness, two words, y’all: crispy leeks! They’re a little extra effort, but they added so much flavor to the dish. I asked Joyce if I could scribble down the recipe and the very next weekend, I was in my kitchen recreating the soup for myself. What a pleasant surprise that in addition to being delicious, it’s relatively quick to whip up! Are you snowbound (or about to be)? Or maybe just hungry? Do yourself a favor and make a big pot of simple-but-magnificent mushroom soup. What’s your favorite simple food that packs a big flavor punch? In a large pot or dutch oven, melt the butter over medium-high heat. Add leeks and saute about 5 minutes or until tender. Add the mushrooms, thyme, and salt and pepper. Cook about 12 minutes or until the mushrooms are soft the the liquid evaporates some. Add the chicken broth, bring to a bowl, and then lower the heat and simmer for about 15 minutes. In the meantime, fry leeks. Heat 1 – 1.5 inches of oil in a skillet over medium-high heat until hot but not smoking. I tested the oil by adding a leek and seeing how appropriately it fried. When your oil is ready, add leeks and fry in batches (they won’t fry well if you try all at once, so do about 3 or 4 batches). Fry until folden and remove with a slotted spoon to a plate lined with paper towels. Sprinkle with kosher salt. After 15 minutes, transfer 1 cup of soup to a blender or food processor and process until smooth. Add this back to the pot and add the cream. Keep warm over low heat until ready to serve. Serve topped with crispy leeks. I am only starting to think soups can be ok and you have convinced me I should try this one! Also such a beautiful photo and setting. Ooh, that sounds divine! 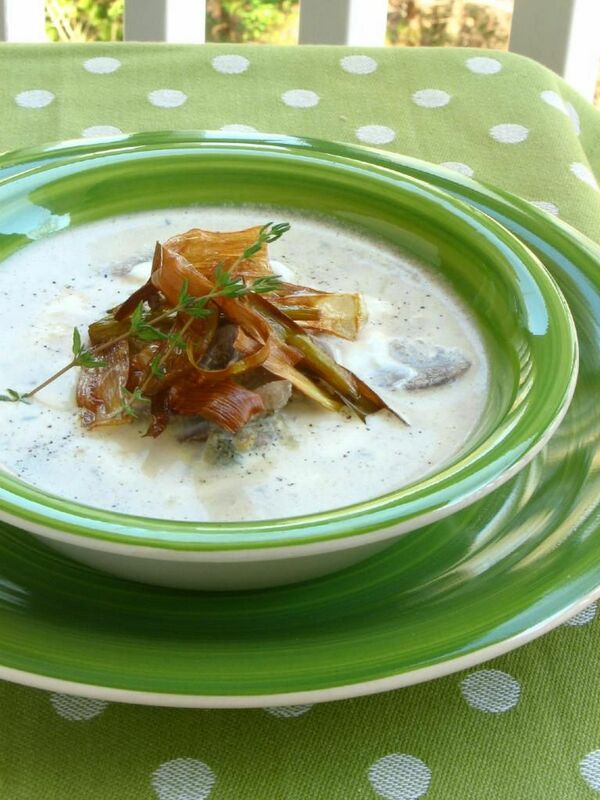 I like making cream soups–Karel likes them, too, but he doesn’t know how much cauliflower goes into them , hehe 😉 Will definitely have to try making crispy leeks! It really is amazing the places you can find mind blowing food…or what exactly that mind blowing food IS. Never fails to amaze me. 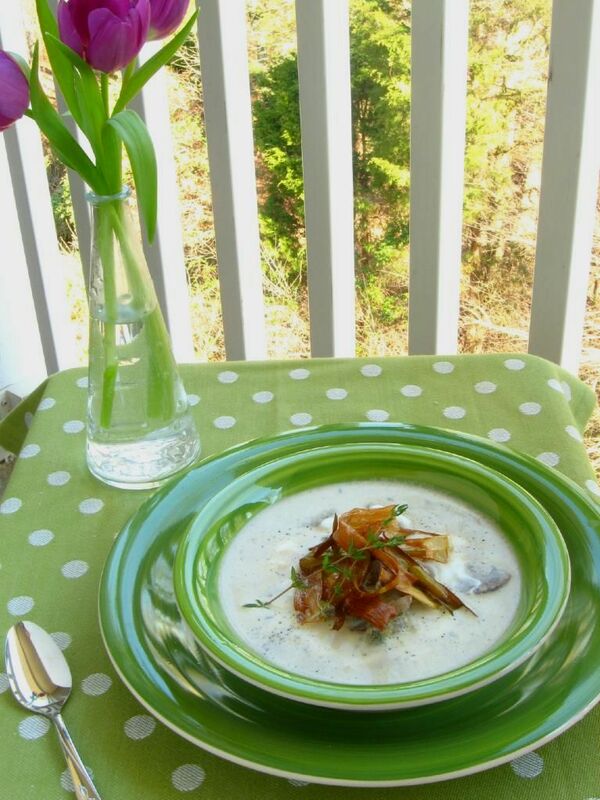 This cream of mushroom soup sounds delicious! 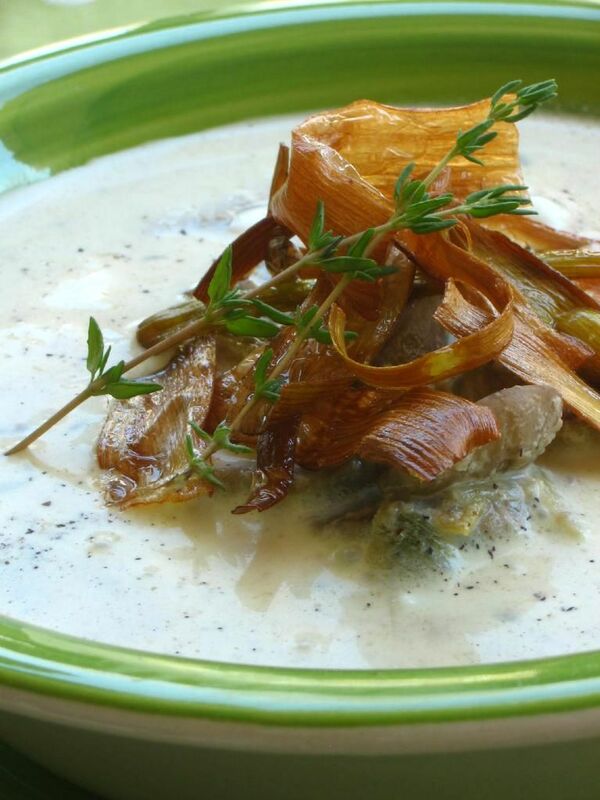 Love the crispy leeks on top…like fried onions but way more gourmet. You had me at crispy leeks! This does sound like the perfect thing to have when a snowstorm is on its way. I absolutely love brussels sprouts and find that a lot of restaurants around here boast really great ones. My favorites are simply sauteed and sprinkled with a little sea salt. 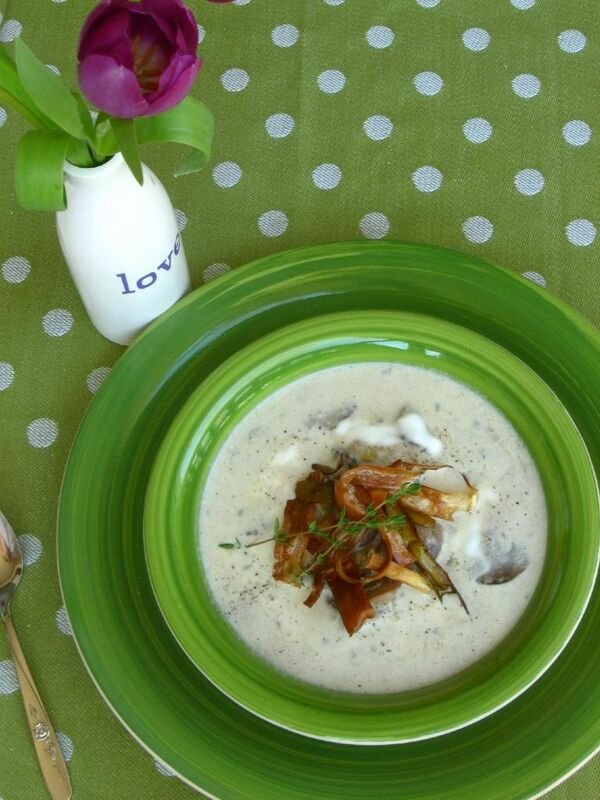 The mushroom soup certainly sounds and looks magnificent! Yum! This looks so good… and easy! I’ll probably try it with vegetable broth because I’m not so much a meat kind of person, but I am a big mushroom person! *gulp*, I can’t wait to make this! A few years ago our family went Ireland. Every restaurant we went to had mushroom soup on special. It was a running joke:) but I love mushroom soup! 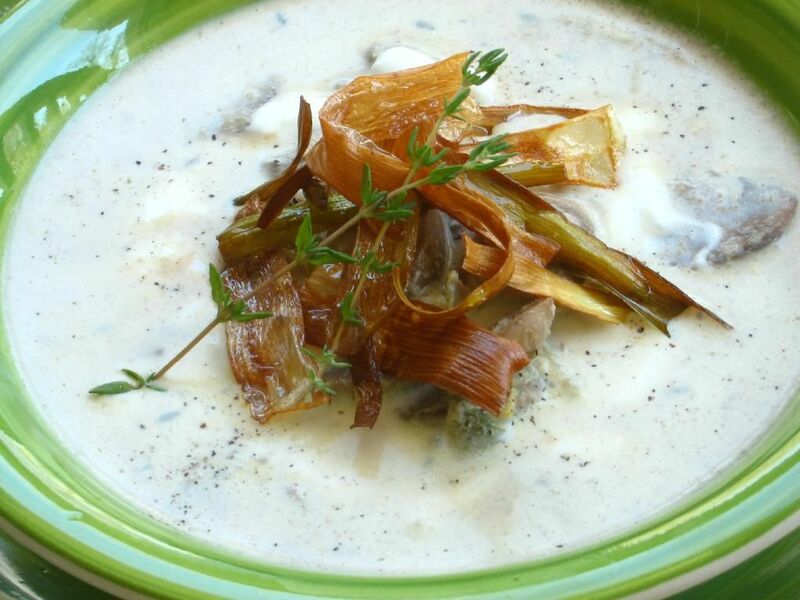 Oh, I love, love, LOVE leeks!!! And I love the soup doesn’t have flour! I’m going to make this for my girls! What a great friend you have and what a lovely meal! This one will definitely have to wait until next winter. The Hubble would never let me serve anything that even remotely resembled a mushroom. Let alone an entire dish dedicated to it. It looks delicious to me though! Hello – this is so not fair! I discovered a few years ago that Dairy is a “very bad thing”! And I really miss a good potato (or mushroom soup in this case) soup. This has heavy cream in it – I don’t supposed fat free or 1% would be a substitute, hmmm? This is a great blog – I will definitely be back to drool over the recipes! Wow, Just made your cream of mushroom soup. I’ve never cooked with leeks before so something new for me. It was easy, quick and oh my – how tasty it is !! Thanks for the great blog, I’ll be checking back in for more wonderful recipes. Hey! Great recipe…but no fair tempting folks with the brussels sprouts. I’ll be up for nights trying to figure them out!